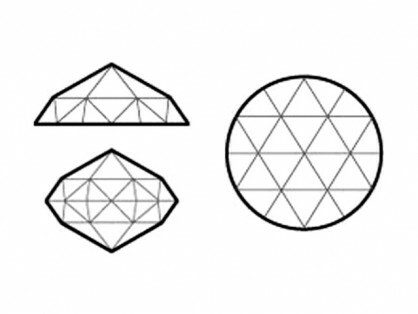 Diagram of a rose cut diamond. Antique rose cut diamond ring, Dutch, circa 1800. The ‘rose cut’, defined by its rounded outline and multiple triangular facets, is one of the earliest diamond cuts, with its origins in sixteenth century Europe. At the time of its development the primary source of diamonds was India, and so one might wonder why diamond cutting was not pioneered there? One theory is that the Indians kept the best-formed crystals for the domestic market, diamond being a gem which, under ideal circumstances, takes the form of an octahedron (two four-sided pyramids, base-to-base). With large, symmetrically-placed facets—an ideal shape to be set into jewellery without any fashioning—, coupled with the fact that diamond is the hardest substance known to man, it does stand to reason that the irregularly shaped diamonds would have been exported. There are two other main factors which likely contributed to the advancement of diamond cutting in Europe at this time. First, key in transporting the raw material to Europe, was the establishment of the first major sea trade port in India with the Europeans, by the Portuguese at Goa in 1510, soon followed by the Dutch and the English. Second is the contemporaneous development of continuous rotary craft tools in Europe, which resulted in the invention of the diamond cutting mill, allowing for more facets, placed at varying angles—ideal for transforming irregular diamond crystals. And so the first diamond cuts with multiple triangular facets was introduced in Antwerp. This can be considered the earliest form of true ‘faceting’, as prior to this the only cut was the table cut, which largely utilized the natural octahedral habit of the stone, but only with the top and bottom points removed, which was in actuality the result of polishing rather than cutting. Why Antwerp? Due to the establishment of the aforementioned seafaring trade with the East, the economic centres of Europe shifted from the Mediterranean (namely Venice, which was the gateway to primarily land-based trade with the Middle and Far East), to the ports of Northern Europe. Thus Antwerp, one of the largest, and with political and economic links to Portugal, Spain and England, became the centre of the international economy and the richest city in Europe. In turn it became the primary cutting and diamond trading centre, which despite the decline of its other industries, persists to this day. Because of this history, the rose cut is also sometimes called the ‘Antwerp’, ‘Holland’ or ‘Dutch rose’. A rose cut typically has a flat base and anywhere from six to twenty four facets, the latter known as a full rose cut. Rose cuts can also be modified to take any outline, such as hearts or drops, or be faceted on both sides to form a double rose cut. Rose cut diamonds remained popular through the late nineteenth century, but today also seem to be experiencing a renaissance in popularity.